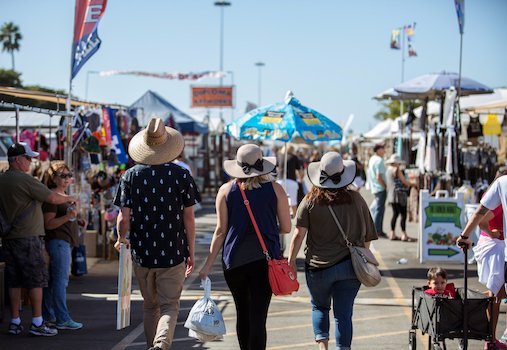 The Orange County Market Place, located on the grounds of the OC Fair & Event Center, offers an unique weekend outdoor shopping adventure. Most days the main stage offers concerts by live bands, and the Market Place also does special events on holidays throughout the year. Whether you're looking for fresh produce, bagels, custom-built furniture, unique kitchen items or maybe even a Mercedes, you'll be rewarded at this shopping fest, which happens every Saturday and Sunday from 8:00 AM until 4:00 PM. The OC Market Place is closed during the month of July for the Orange County Fair. Hours: Saturday and Sunday 8 a.m.-4 p.m. Admission: General $2. Children under 12 are free. Parking: Free. Location: OC Fair & Event Center - Parking Lot A. Enter Gates 2 or 10.